That America has an aging population is well known. Estimates data released this summer by the Census Bureau illustrate this transition in progress – and paint a picture of an actual shrinking number of children in many major American metro areas. From 2010 to 2014, the percentage of the population of residents under the age of 18 shrank in every single metro area with more than a million people. This reflects the aging of the population in progress. But it’s not just that there are more older people. In about half of these major American metros, the actual number of children declined. These results roughly fall alone lines that would be expected, with regions that are rapidly growing their total population, like Austin, also strongly growing in children. 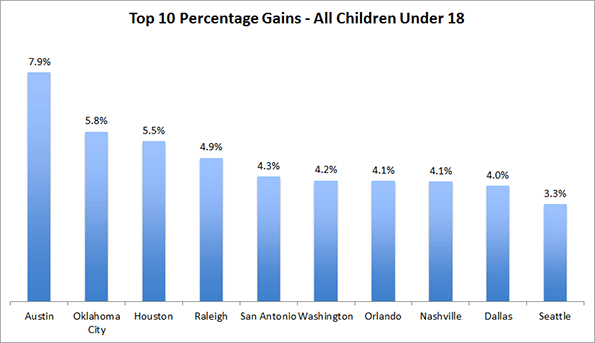 In fact, Austin was the top gainer with a 7.9% increase in children. Houston (+5.5%), Washington, DC (+4.2%) and Denver (+3.1%) were also among those posting strong gains. 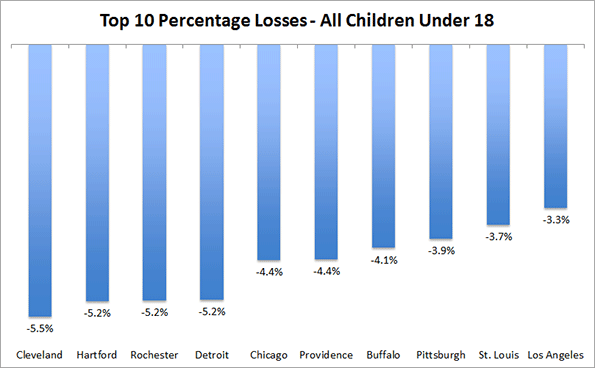 The loss department is dominated by usual post-industrial suspects, with Cleveland being the “biggest loser” at -5.5%. Detroit (-5.2%), Chicago (-4.4%), and Philadelphia (-2.7%) were also among the losers. But you don’t have to have crummy weather to lose kids. 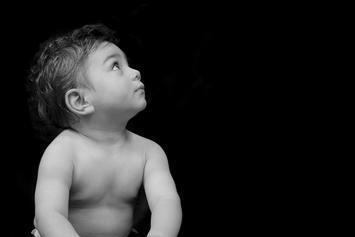 Notable among those losing children is Los Angeles, whose child population dropped by 3.3% or over 100,000 people. This loss is not being made up, as in the past, by the Inland Empire, with Riverside-San Bernardino also seeing its child population shrink, by 2.1% or over 25,000 people. This is a remarkable reversal for Los Angeles, once one of America’s great growth stories. This loss of children augurs poorly for reversing population loss or stagnation in many of these regions. With the next generation of women of childbearing age smaller than the one before it, this suggests even further declines are possible. In sum, while very few regions are losing population on a total basis, many more are failing at creating the next generation of residents. Of course it is possible to make up for natural increase in population by attracting newcomers, but consider that these statistics include the children of those recent arrivals as well. Looking at younger, pre-school age children under the age of five, even more – 34 out of 54 – large metro areas showed a decline. This includes surprising small losses even in rapidly growing, traditional family magnets like Atlanta, Charlotte, Nashville and Kansas City. This reflects how pervasive low birthrates have become. 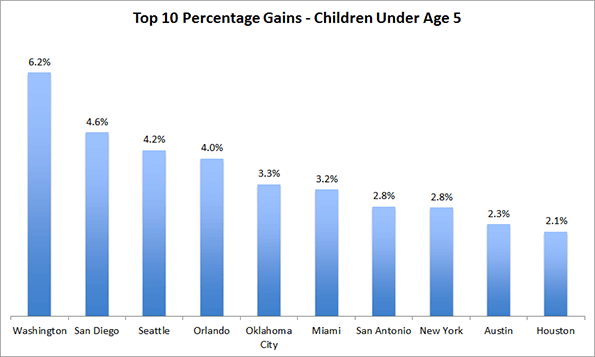 Conversely, again some traditionally slower growth cities and some conventionally viewed as not child friendly-- San Francisco, Seattle, and Boston are seeing slight gains in their population of young children even though their percentages drop. Keep in mind these are metropolitan area numbers, not central city ones, as most children, particularly those older than five, end up in suburbs. But even so, the performance of these regions is remarkable compared to declines in celebrated urban areas like Chicago and Los Angeles. The Pacific Northwest cities of Portland and Seattle also make for an interesting contrast. Both have experienced similar, and healthy, overall population growth since 2010, with Portland growing slightly faster. But the Seattle area was a much stronger performer when looking at children. In fact, Seattle ranked #10 (out of 53) large metros in the country with 3.3% growth. Portland, however, eked out only 0.4% growth. Looking at children under age five, Seattle actually ranked third in growth at 4.2% while Portland shrank by 2.6%. And New York City is a particularly interesting case. Its total child population declined by over 47,000 people, or 1.1%. But its under five population grew by over 33,000, or 2.8%, and it was one of only two large metros, along with Buffalo, that actually increased it share of the population in that age group. Brooklyn and Manhattan led the way, each posting double digit percentage growth, though from a low base in Manhattan’s case. Queens did nearly as well. 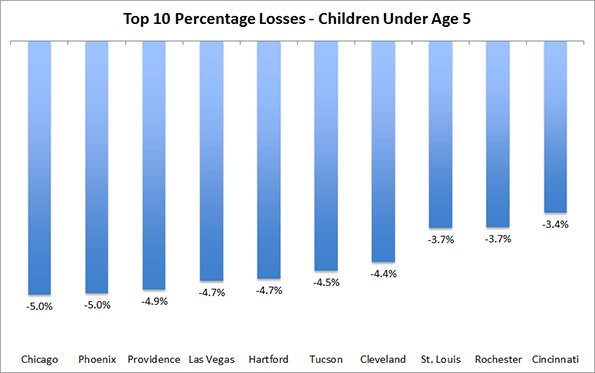 Staten Island, traditionally the most family centered area, was the only borough to lose young children. Long Island, Westchester, and Dutchess County lost them as well. The real question is whether places like Manhattan will be able to retain these families as the kids reach school age. Its population of those 5-17 has continued to decline. Given its high costs, it’s not realistic to expect Manhattan to ever be a premier family magnet. But there are surely some city-dwellers with children who might want to stay if life with children could be incrementally better supported in the city with things, such as low crime, clean parks and good schools, that tend to matter to families. This challenge will be felt by all cities as their youth populations begin to enter their prime childbearing years. Submitted by Daniel Jelski on Fri, 09/25/2015 - 11:45. I'm curious why Salt Lake City isn't mentioned in this post. I thought it would come out near the top in kids. Submitted by Aaron M. Renn on Fri, 09/25/2015 - 13:00. Salt Lake City has the highest percentage of its population who are children, but isn't growing that fast and even saw a shrinkage in the total number under age 5.